Watermelon or Citrullus lantus is a tasty and refreshing fruit that symbolizes summertime with warm weather, picnics, and fun. With a high water content, approximately 92%, watermelons are believed to have originated in Africa several thousands of years ago and traveled over time from there to Asia, North America, and Europe. The seeds and leaves have even been discovered in ancient Egyptian tombs. Watermelon is related to the cantaloupe, squash, cucumber gourd, and even pumpkin. They can be round, spherical, or oblong and have thick green rinds that can be spotted or striped. The sizes are numerous and can range from a few pounds to well over 90 lbs. 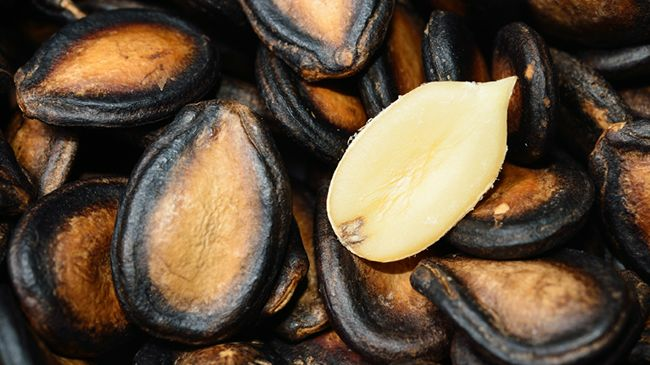 Even though we often discard the seeds, they are full of nutrients, proteins, fatty acids, minerals, and vitamins. Watermelon seed oil is often called ootanga oil or kalahari oil. It can be extracted a few different ways: the expeller method, cold pressing, solvent extraction, or oil clarification. Traditionally the seeds are removed from the rind and dry outside in the sun before being extracted. There are phenolic compounds in watermelon which includes carotenoids, flavonoids, and triterpenoids. This fruit is full of anti-inflammatory and antioxidants, but the star nutrient is lycopene. It possesses more than 60% linoleic acid and has omegas 3, 6, and 9, which are great for cardiovascular and immune health while also aiding our nervous system. Watermelon seed oil has palmitic, oleic acid, steric acid, B-Vitamins, copper, manganese, magnesium, and zinc. With that amazing composition, it is no wonder that this oil is just that…a wonder! Watermelon seed oil is great as an emollient for moisturizing your strands and scalp. This ultra-light oil does not clog pores, so no dirt can accumulate on the scalp. It is also extremely moisturizing without being overly greasy. The abundance of antioxidants boosts scalp circulation and in turn helps with hair fall. The essential fatty acids help to moisturize the hair and scalp while preventing hair breakage. The copper helps the production of melanin and is responsible for keeping hair color intact and the potassium is an important component of cell growth, which aids in hair optimal hair growth. Watermelon seed oil is has water-soluble properties that make it great for skin and scalp absorption. It also helps with skin and hair elasticity. It also dissolves sebum buildup and an all-around great oil for scalp, skin, and hair. It can be used alone for hot oil massages and pre-poos or as a blended hair oil for hair masks or treatments. Measure all ingredients into a small bowl and mix well. This makes around 2 oz. of a potent hair mix that can be warmed and used as a hot oil massage, pre-poo, hot oil treatment, oil rinse, or sealing.